"To create the most objective and holistic representation of the media as possible, I vigorously researched news sources from both sides of the political spectrum. This included everything from Breitbart to Occupy Democrats. In this book, I only reference writings from the ‘news’ and ‘politics’ sections and not the ‘opinion’ ones. The following news organizations were the most credible and almost always agreed about the facts. To represent the Trump Administration’s news, I used quotes from the White House website, Donald Trump’s website, the White House Twitter, and Donald Trump’s Twitter as well as statements made by Trump or his Press Secretary Sean Spicer vocally." My intention was that this book something any American could theoretically own and learn from, so I wanted to keep the physical product cheap and accessible. With this in mind, I printed this book on regular glossy printer paper and perfect bound it. I also choose this size because it is easy to hold and manageable to take in visually. In wake of all the messy politics happening right now, I wanted to create something to present truth in a very clear, factual, and nonpartisan manner. Something that could be informative for anyone no matter their stance or involvement in politics. 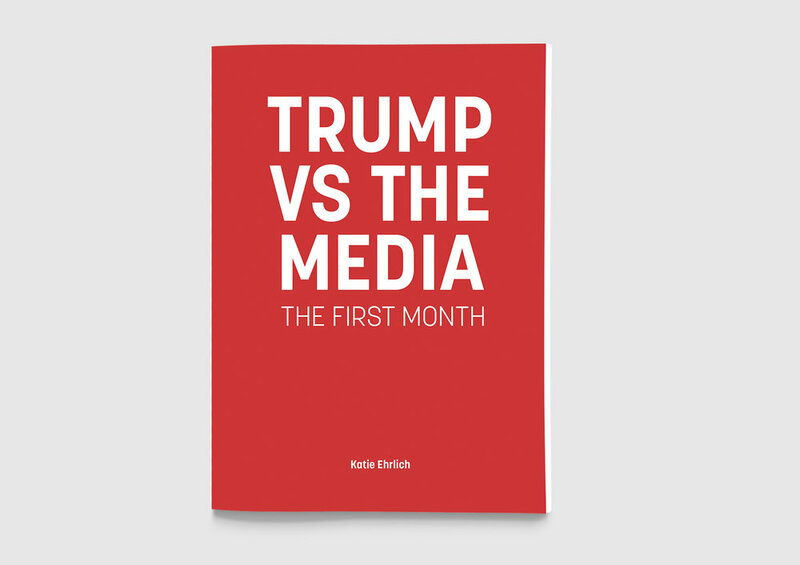 This book compares White House statements against both left-wing and right-wing news sources to demonstrate the objective fallacies spewed from the current administration. Juxtaposed pages are designed identically to remove any visual biases, allowing the weight of the truth to ring. 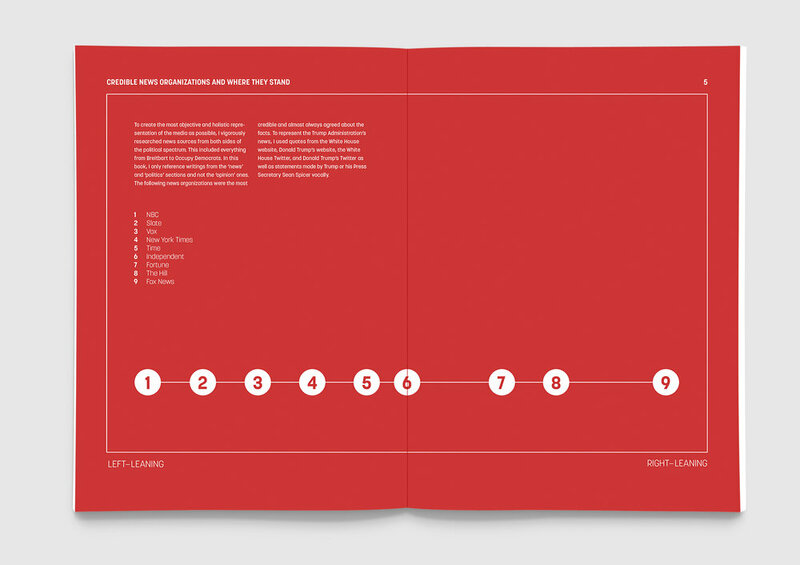 The book begins with a chart weighing the cited news sources based on which way they lean. This was meant to show the wide scope of sources used and how even the most conservative of sources reported facts that the White House denies. 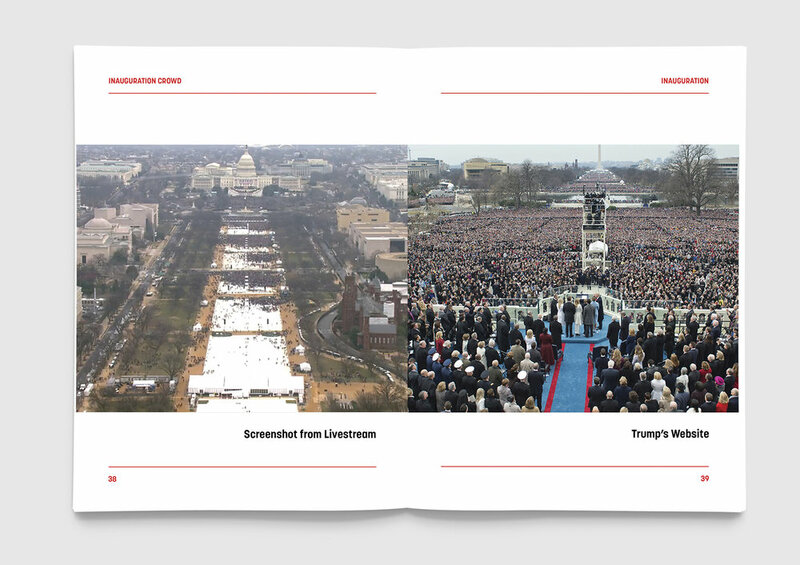 The book is divided into four sections, each one covering one of the most contentious topics during President Trump's first month in office. The sections are Foreign Leaders, Cabinet Picks, Muslim Ban, and the Innauguration. 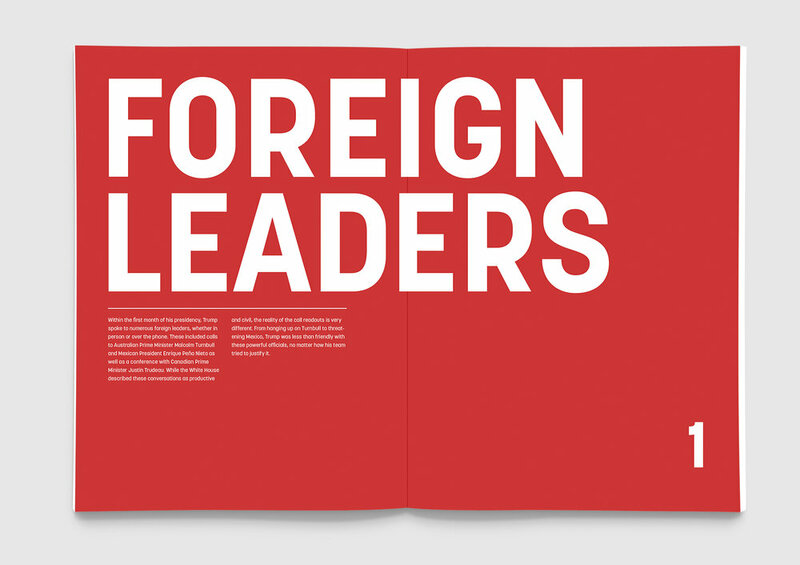 The majority of the book is comprised of these side-by-side quote spreads. The left page quotes an article or headline from a news sources while the right contains a White House statement on the same topic. The overall section is listed in the top right, while the specific event appears in the top left. Each section also has image-based pages that compare how each topic was portrayed by the news compared to the White House.